The man, who allegedly killed a man who was in a relationship with his ex partner, was Monday arraigned on a charge of murder. Thirty-two year old Corwyn ‘Cross Eye Arthur of 1088 Cinderella City Amelia’s Ward, Linden was not required to plea to the inevitable charge. Linden Magistrate, Clive Nurse remanded Arthur to prison until June 21. Arthur is accused of the murder of Claude ‘Sonno’ DeJonge while he and his partner were at his reputed wife’s home, located at 1074 Cinderella City, Mackenzie, Linden. 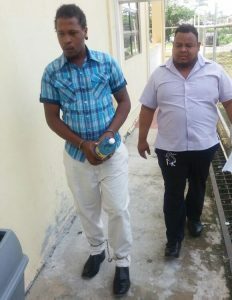 His arraignment came four days after he was arrested last week Thursday at Bennett Dam,Rosignol Village,West Bank Berbice. The Guyana Police Force has already stated that Arthur had shared relationship with Dr Jonge’s reputed wife and he had occasionally visited her home. Hours prior to the killing, he Holder had visited her and confronted by the Dr Jonge. An argument ensued and the suspect left after the police were summoned. Police had aid about 1 AM Thursday DeJounge and his reputed wife were asleep when they were confronted by the suspect who gained entry via an open window and during another altercation the suspect , who was armed with a knife, allegedly inflicted the fatal injuries and fled the scene.